The World's Smallest Noise Real- Time Frequency Analyser - Now with 1/3 Octave and Ln%! The CEL-600 series sound level meters use the latest digital technology to give standards of performance never seen in such a compact design. Using a high resolution colour TFT display, the CEL-600 series is specifically designed to ensure that taking noise measurements is quick and easy. Different models are available depending on your requirements for use in general environmental noise measurements, up to full frequency analysis in 1/3 octave bands. The CEL-621 further develops the success of the CEL-620 intended for the occupational user. Statictical parameters (Ln%) are now included in order to perform environmental noise assessments. Five Ln% values are simultaneously measured and the percentage values can be adjusted to particular requirements. A choice of frequency analysis in Octave (16Hz - 16kHz) or 1/3 Octave (12.5Hz - 20kHz) is available. Analysis is performed in real-time using a single measurement range to 140dB, ensuring no range adjustments are required for either broadband or frequency based measurements. 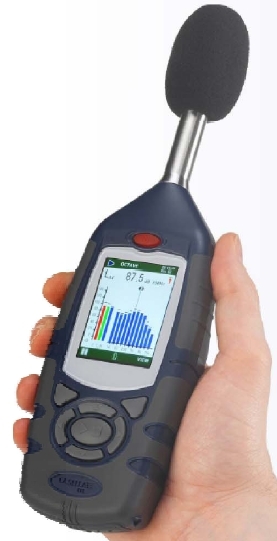 The CEL-621's highly intuitive user interface is colour coded to make noise measurements easy making it the ideal tool for hand-held environmental noise measurements. The CEL-621 has a USB interface, where data is stored in a Microsoft Excel(TM) ready format. Alternatively data can be downloaded using bespoke software. All instruments and calibrators are provided with calibration certificates. Complete kits are available with acoustic calibrator (CEL-110), kit case, windshield, instruction manuals and USB cable. For a complete instrument kit add /K1 to the part number e.g. CEL-621B1/K1.